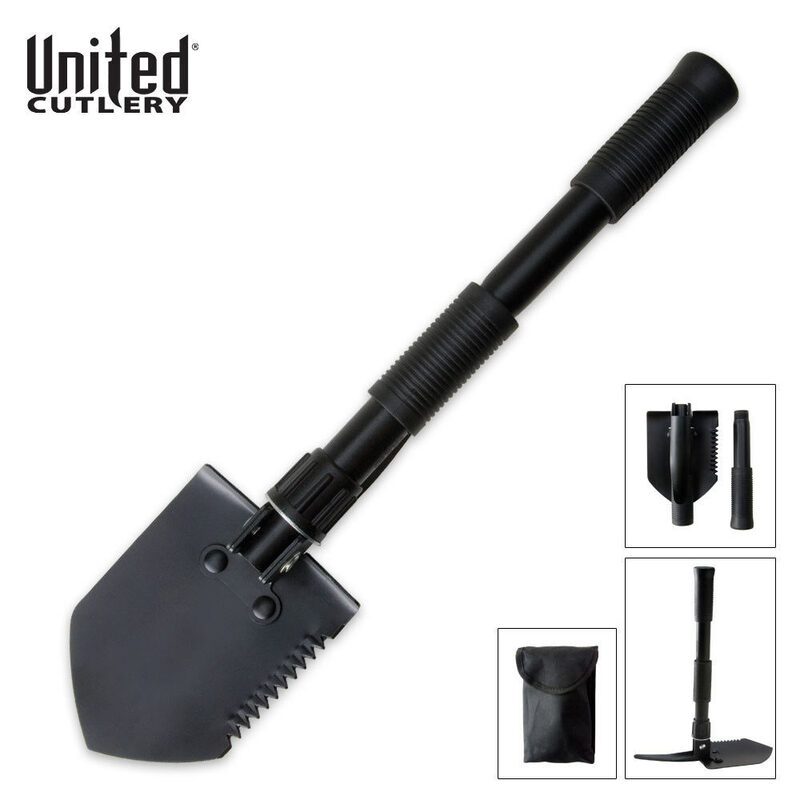 United Cutlery Folding Survival Shovel Entrenchment Tool | BUDK.com - Knives & Swords At The Lowest Prices! This United Edge Camp Shovel makes for a versatile camping companion that is easy to pack and carry. It offers the versatility of a shovel with the handy option of a dibble pick. Neat little tool. Feels sturdy. So small when folded and in its pouch it'll fit in the console of my car. When this shovel came in I was really exited for it, but it was much smaller than expected. The head is a little wobbly and slanted at an angle. Not as pleased as I thought I would be. I bought two of these recently. One for each car/bugout bag. Used it this weekend while camping and beat the heck out of it and it held up just fine. Very pleased!! Nice little tool. Handy,and it works well too. This is a very small, compact shovel. It packs away well, but does not seem overly sturdy. It is questionable that they would hold up to any serious use. I purchased one for each car for emergencies and hope I never have to use them. Quality of shovel is fair. The pouch is of very poor quality. I had to have mine replaced because of a large rip in pouch out of box. A little more quality control would be nice if possible. Also the shovel is very small. An awesome buy. It is small but I knew that prior to ordering it. It is about a foot an a half completely assembled. This is a great addition to keep in my boyfriends trunk for an emergency! Not a very large shovel, but sturdy and the saw is sharp. Without the handle extension, it is like holding a large trowel. not to say that it is not a good piece. It is portable, and handy to have while camping or packing light. I`m sure that it could do some heavy-duty work, just on a smaller scale. The only complaint I have is that my handle extension will not screw in all the way, rather it just keeps rotating. Thus stripping the threads. All in all, though, a very handy highly portable survival tool. I definitely expected this to be double the size...but it's a really neat tool. Great for camping, it would make quick work of digging a campfire hole. The saw is not sharp, but that can be fixed. I have yet to actually use it, but it's a really nice addition to my camping and survival gear. It is really easy to put together and take apart, as well.